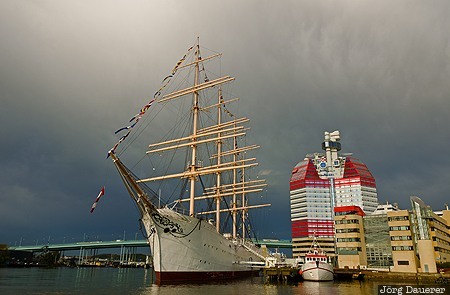 The four-masted steel barque "Viking" and the characteristic Skanskaskrapan building (The Lipstick) in Lilla Bommen the harbor of Gothenburg illuminated by warm evening light in front of dark rain clouds. Gothenburg is in Västra Götaland, Sweden. This photo was taken in the evening of a rainy day in September of 2014. This photo is in the Photo Calendar "Südschweden". This photo was taken with a digital camera.